When is the best time to visit Knott’s Berry Farm? Dubbed “America’s First Theme Park,” Knott’s is just a few minutes away from Disneyland and is one of the most popular destinations in Orange County, California, with more than 3 million visitors every year. The park, which opened in 1940, is open year-round and features over 40 rides, including 10 roller coasters. So, when is Knott’s Berry Farm least crowded? Here are some of the best and worst times of the year to visit the park. New Year’s Day – Some of the holiday season crowds are still around during the first week of the new year. After that though, crowds are very light on weekdays and weekends aren’t too bad either. MLK Weekend – The park gets busier on the Saturday and Sunday of the 3-day holiday weekend. Crowds on Martin Luther King Jr. Day itself are usually manageable. Presidents Day – Crowds traditionally pick up for the holiday weekend. The rest of February is pretty quiet, especially weekdays. Attendance is usually highest on Saturdays. Spring Break – Knott’s gets crowded for Spring Break on the last week of March, as well as the week before Easter and the week of Easter. That’s when many schools in the area are off, so be prepared for it to be busier during these times. Memorial Day Weekend – The holiday weekend marks the start of the summer season as schools start to get out. That Saturday and Sunday is usually very busy. Summer Season – Aim for going on the first couple weeks of June if you can, as crowds are usually manageable early in the month. By mid-June, most schools are out for the summer and it starts to get crowded even on weekdays. 4th of July Weekend – The summer crowds are out in full force in all of July. 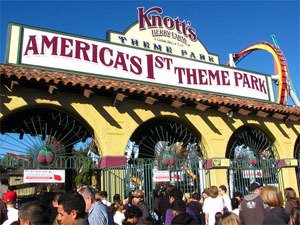 Knott’s Berry Farm is typically crowded throughout the month, including on the 4th of July. Weekdays would be your best bet for shorter lines. Summer Season – The summer crowds start to die down in August. Fridays, Saturdays, and Sundays are still busy early in the month. Weekdays on the last two weeks of August is one of the best times of the year to go, as hours are still extended, but most of the summer crowds are gone. Labor Day Weekend – The crowds are back on the Saturday and Sunday of Labor Day Weekend. Labor Day itself typically isn’t too crowded. Halloween Haunt – Shorter hours for the Haunt event in the evening mean minimal crowds during the day. Crowds on the weekdays are very light. Check out our Knott’s Scary Farm guide for the best days to go to Halloween Haunt. Veterans Day Weekend – Crowds pick up for the holiday weekend. Saturday, Sunday, and Monday (Veterans Day) are usually packed. Thanksgiving Week – The bulk of the Thanksgiving crowds arrive after the holiday, on Black Friday and Saturday. The days before Thanksgiving and Thanksgiving Day itself are usually manageable. Holiday Season – Be prepared for the park to get busier on the last two weeks of December, as the big holiday season crowds arrive on the week of Christmas through New Year’s Eve. Christmas Eve is usually manageable, though. Knott’s is closed on Christmas Day. New Year’s Eve – Knott’s is traditionally packed for New Year’s Eve, so try to get there early. For crowd predictions of upcoming dates, as well as historical crowd ratings, check out the Knott’s Berry Farm Crowd Calendar. For live crowd updates and conditions at the park, check out the Knott’s Berry Farm Crowd Tracker. When do you think is the best time of the year to go to Knott’s Berry Farm? How crowded was it when you visited?